An inches-only foot rule which I built for myself to use. This site is designed to oppose metrication specifically in the UK as well as around the world and to show the advantages of the imperial/US customary system from a young person's perspective. My main areas of focus are distances and heights on roads, measurements taught in schools and weights and volumes used in shops. A national speed limit sign. 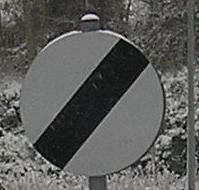 60 MPH is the national speed limit on this road (Dansteed Way, MK). 15 January 2008 - General corrections made, units in transport page added. 8 October 2007 - Support for students updated for energy units, I intend to re-name that page soon so it's clear it is for anyone who wants help understanding all of the units and relationships between them. 16 September 2007 - I have now added a page clarifying the EC announcement and explaining what good it has done and what it still leaves wrong. Also, more information has been added to the support for imperial-preferring students page. 16 August 2007 - Added several pages over the last month. Additionally, the support for students page now contains a short overview of the FPS system. I intend to add a few (obviously unofficial) practice physics questions in imperial units, similar in style to the metric ones I am usually asked in lessons, to aid students who, like me, wish to exercise that little concept of free will and use the imperial system. 13 July 2007 - Site is now online.